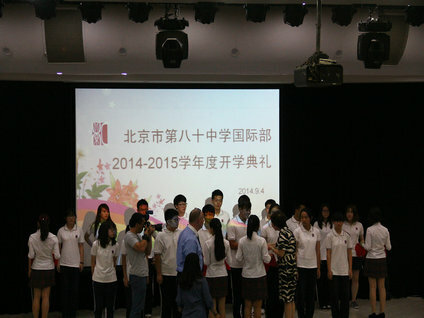 At 4 pm of September 8th, 2014, all the teachers and students from International Department of Beijing NO.80 High School gathered in the lecture hall to attend the opening ceremony. 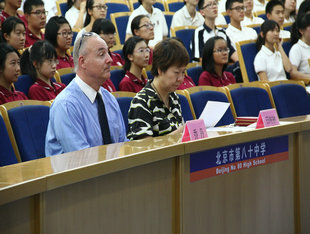 Tian Shulin, Principal of Beijing No.80 High School, and Jordan, academic vice-principal of International Department, gave speeches at the opening ceremony for the new semester. 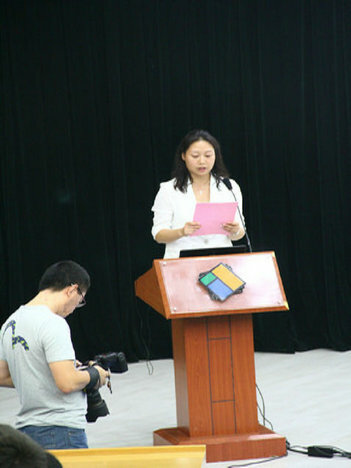 First of all, Principal Tian made an ebullient speech at the opening ceremony. 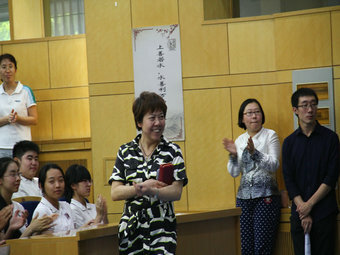 She warmly welcomed the arrival of new students, and conveyed sincere greetings to current students. 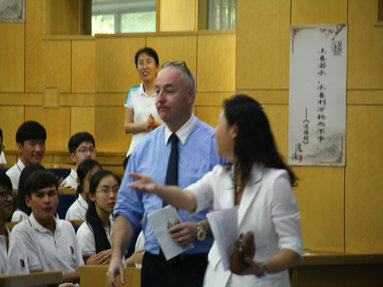 Principal Tian pointed out that in the last year, both school's teaching level and activities' quality have made great improvement. 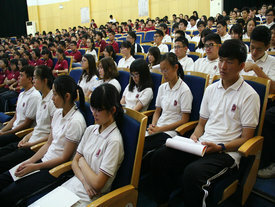 The power, prestige, and quality of students from the International Department also increased gradually. Students from the international department have undeniably added color to the campus. 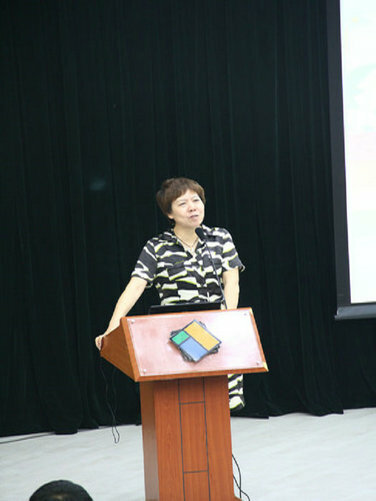 Meanwhile, Principal Tian wished students from International Department could acquire more knowledge and enhance greater capacity in their high school life, and become international talents. 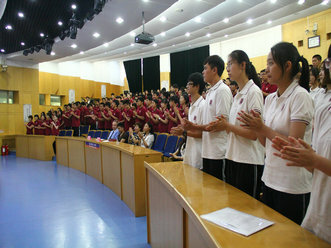 She also hoped students to keep their identity of “80 person” and school song firmly in mind, and win honors for our school in the future. 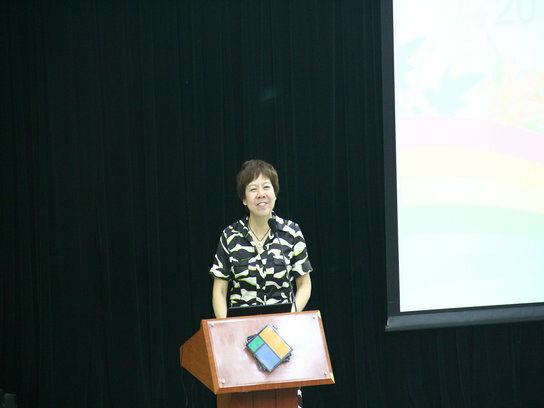 After Principal’s speech, Cui Weimin, Director of International Department, commended outstanding collectives and individuals in last semester. Awards were given to the outstanding students who made success in their academic studies and who made prominent contributions to their class. 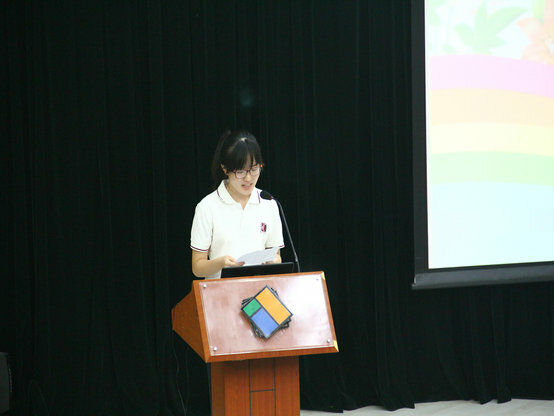 Then came the speeches from student delegates. 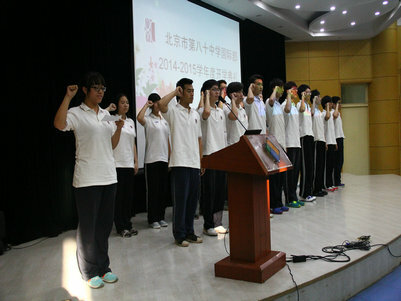 Hu Xiaoqi, a senior three student, spoke first as a member of the student union. 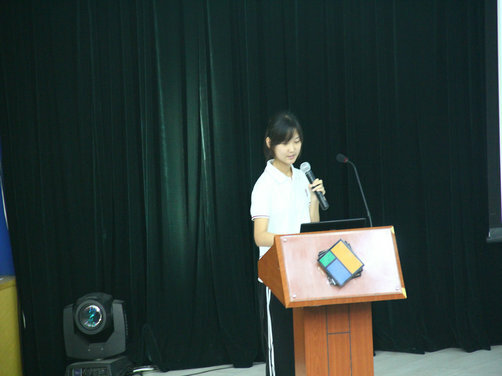 Hu Xiaoqi firstly introduced the composition and functions of student union to the audience, and then shared her insight gained from her working experience. She found that, through her job at student union, she learned a lot of things which she couldn't learn from the text book. 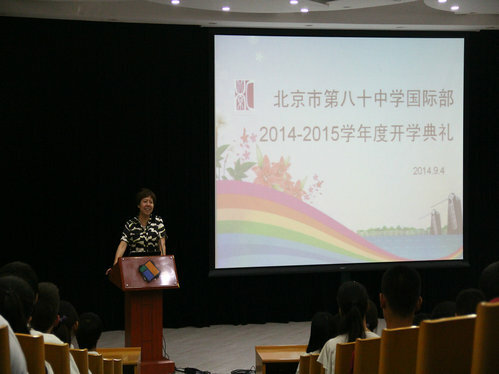 Miss Hu also took this opportunity to invite every new comer to join the student union of international department. 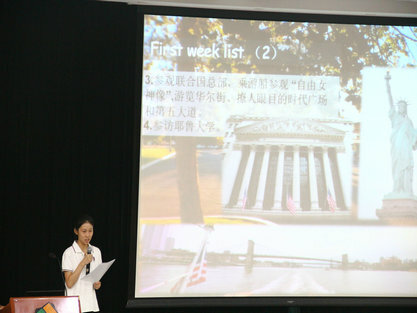 Wang Yanyi, a senior two student, introduced her summer travel as a participant of Sino-US Summer Camp. Wang Yanyi started with a short clip of their travel. The elaborate short clip recorded the interesting things she saw. In the first week of her summer travel, they visited Washington, Boston, and New York. In those places, they visited Yale University, Massachusetts Institute of Technology, Boston University and other famous university. In New York, they appreciated the Statue of Liberty and Wall Street. Their homestay life in the second week was also full of fun. They not only experienced delicious exotic dishes, but also improved their English in communication with the American friends. 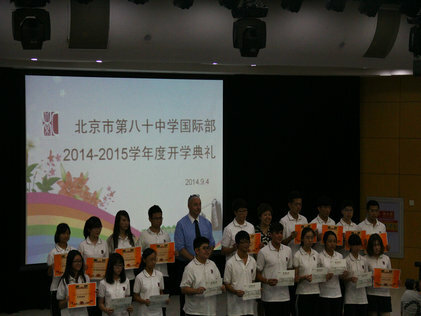 Liu Ting, a Grade Eleven student, introduced her summer travel as a participant of Sino-UK Summer Camp. Liu Ting reviewed her travel from two aspects, "Tour" and "Social Practice".In the “Tour” part, she mainly talked about where they went. They visited Britain’s traditional schools, such as Cambridge, Oxford, and King’s college. They visited famous companies, such as Lloyd, BBC, and Cadbury. They visited scenic spots along the River Thames, such as Tower Bridge, Big Ben and London eye. They also visited the Manchester United and the Bank of England. 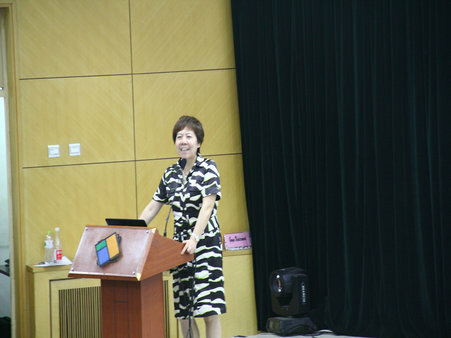 In the “Social Practice” part, Liu Ting mainly talked about what they needed to finish. They needed to complete such heavy tasks as discussing, learning, doing research, which occupied almost all their spare time. Yet Liu Ting didn’t resent these activities. She said, such tasks helped them with team working ability, and cultivated them self-confidence and self-reliance although they were difficult. 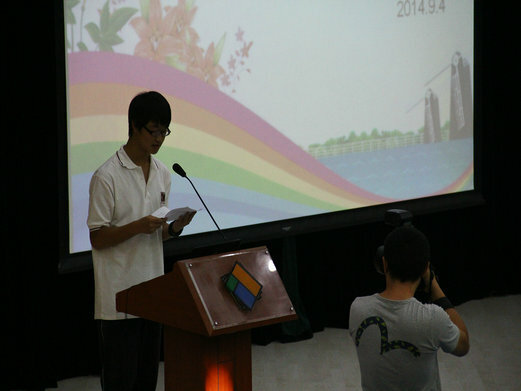 Chen Weixin made a speech on behalf of the senior students. He showed his confidence in overcoming the difficult stages in his life. “No matter how vicious the battlefield is, how complex those multiple choice questions are, I’ll never give up, I’ll believe in hope, and finally win the day.” He said. 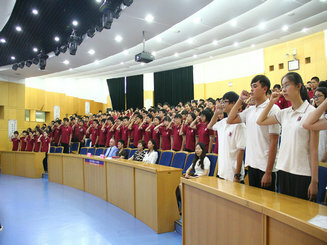 In the end, the freshmen, with the help from the senior students, wore the school badges on their uniforms, and swore that they would display global innovative ability characterized by high ideals, being responsible, being a learner, and being good at cooperation. The opening ceremony ended, and new friends joined us. We hope this opening ceremony can become one of our wonderful memories.